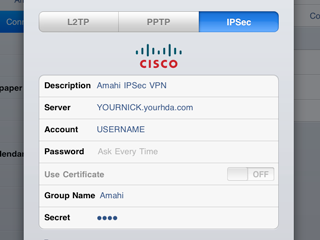 This application is an end-to-end IPsec VPN, customized for Amahi. It's a simple to install, simple to use, secure, VPN. It's compatible with Apple's iOS devices like the iPod, iPhone and iPad, Android devices (ICS or later) and many Windows IPSec VPN clients. IPsec is an end-to-end security scheme operating in the Internet Layer of the Internet Protocol Suite. Some other Internet security systems in widespread use, such as Secure Sockets Layer (SSL), Transport Layer Security (TLS) and Secure Shell (SSH), operate in the upper layers of the TCP/IP model. Hence, IPsec protects any application traffic across an IP network. Visit the IPSec VPN wiki page for client installation and for more details.